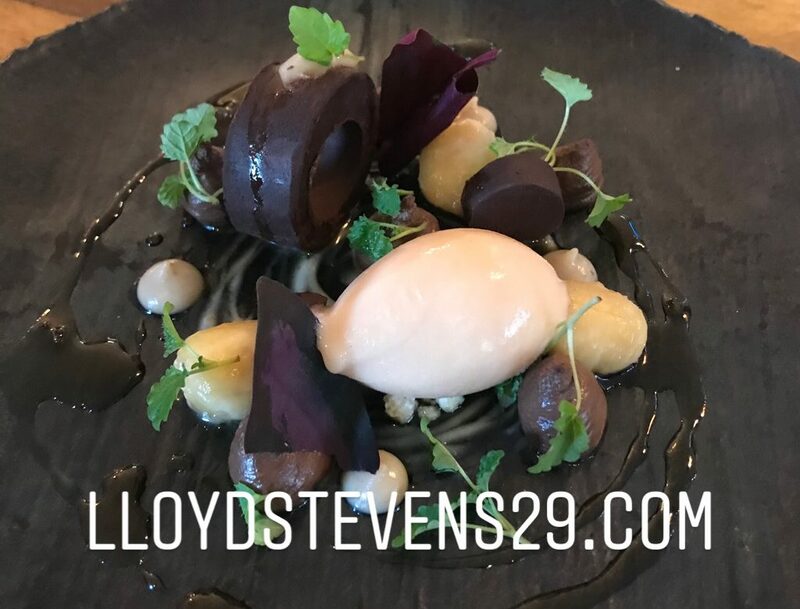 The first time we dined at Crockers was at their old place in Potten End but now that they’ve moved to Tring the restaurant has improved in more ways than one. The first being the location which is now in a nice little town and only five minutes of the A41. Secondly they now have a nice cocktail bar which is perfect for a pre Lunch/Dinner drink. Then lastly when your escorted upstairs to the dining area you really see how much better this location is. There’s 15 very comfortable seats situated around the chefs table where each dish receives it’s finishing touches. Behind this area is the open kitchen where you can see the chefs prepare each dish to perfection. On our arrival we were given a nice welcome by Jess and was then asked if we’d like a pre Lunch cocktail. We said yes and enjoyed a delightful Negroni & Hugo while sitting at the bar. It was also lovely for Scott to come down from the kitchen briefly to say hello and get our immediate thoughts on the new venue. After our drinks we were then taken upstairs to the dining area. When you looked around you could that there was a nice space between each of the couples as well as the one party of four. So now on to the food to which we started with some delicious snacks. This was followed by the amazing Tring Brewery Beer Bread with Marmite Butter. Our next course which was an absolute delight was the Teryaki Salmon , avocado , radish , sesame & coriander. This was followed by an equally fabulous Scallop dish that included confit chicken , sweet corn & mushrooms. We then moved onto the main course which was amazing a perfectly cooked piece of Salt Aged Cumbrian Beef with garlic , turnip & watercress simply stunning. Following the beef was the cheese course which apparently has been dividing opinion amongst diners at the restaurant. It was Lancer Cheese sat on top of a crumpet and then blow torched and I have to say I was definitely in the minority of guests who wasn’t that keen as the majority seemed to love it. Before dessert we were given one of the best pre desserts I’ve ever had a truly fantastic Cucumber Mojito which just totally refreshed your palette. This led you onto the dessert and just like all the previous dishes this to was amazing as you had English Raspberries , white chocolate , rose & pink pepper. A delightful way to finish. A word now for the sommelier who matched each course with a delightful selection of wines and even if you wasn’t totally happy he was more than pleased to provide an alternative choice. So once we’d had coffee & petit fours that brought to and end a wonderful lunch which definitely seemed to be enjoyed by everyone. That Cumberland beef looks perfection. Sounds like the move is a good one – love a good cocktail bar! Oh my gosh that dessert and petit fours! 😍 what a yummy looking meal!! !